Heirloom® Memorials are simply the best … period. The granites selected for the Heirloom® brand have weathered the test of time and have proven to be the very finest quality granites for cemetery memorial use. Heirloom® granites offer the highest luster quality for polishing, the most uniform grain in texturing, and the finest color contrast for carving and lettering. 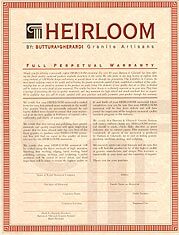 All of this is backed by the Heirloom® Full Perpetual Warranty Program, which not only guarantees the granite but also assures you of the finest craftsmanship on all surfaces as well as hand-crafted art work. Look for the Heirloom® Seal to be engraved on every Heirloom® memorial as your symbol of confidence and protection through our exclusive Perpetual Warranty Program. Heirloom® is truly the finest memorial product available, anywhere. The Artisan® brand of memorials is also of excellent quality. The granite selected for these products will have very high luster in polishing, uniform texturing, and strong contrast for carving. 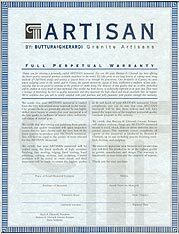 These granites are second only to Heirloom, and the Artisan® Seal is your assurance that this product is backed with an Artisan® Full Perpetual Warranty Program.